Ladies, have you ever encountered a situation when engaged in a spot of on-line dating that, with great anticipation, you arrange to meet for the first time, your Mr. Rights, a suave, slim, handsome, rich, witty, successful, etc. guy…and someone like me turns up? Well, if you have, you may well feel mightily let down, a feeling that I had when viewing the Russian National Ballet production of “Swan Lake”. “Russian National Ballet” – grandiose title, so they must be good. National – state endorsement in a country that prides itself with its plethora of ballet companies and academies, that, no other country can rival for it’s quality in depth – well you can imagine my sense of anticipation. Oh dear! Wrong! Not the Russian National Ballet performing – just producing. Wrong! Not a state endorsed ballet company but a family run business. Wrong. Not a Russian Company at all, but one from Belarus. That used to be the annoying country to the south of Russia, that you needed a visa to visit or travel through, as I found out to my cost hen planning a rail journey from London to Moscow. Nowadays you can have 30 days to sample the delights of this country, not exactly on the tourist map. The Russian National Ballet’s mission, is to keep the tradition of classical Russian ballet alive, “by bringing various ballet theatres from Russia and Belarus who embrace the traditional nature of this refined genre. I know this, because it says so in the programme. This also informed me that I was watching the “State Academic Theatre of Belarus”, a fact that I didn’t realise until I returned home after the performance. For many in the audience, who didn’t buy a programme, they most probably still believe that they had seen the “Russian National Ballet” in action. I googled the “State Academic Theatre of Belarus” but couldn’t find any reference to an institution by that name. There is one with a similar title in capital Minsk, so I guess this must be the home of the corps de ballet on display. Having kind of sorted all that out, I turn to the ballet itself. There are many versions of “Swan Lake” that have evolved from its first performance by the Bolshoi Ballet on 4th March 1877. This version is the shortest swanning in at the two-hour mark, which includes a 20 minute interval. After a rather flat (literally) start the company gradually got into gear. I wondered whether their rather inauspicious start was down to the gruelling schedule that the company have endured since commencing their UK tour on 3rd October. By the time they reach Brecon, five weeks later, they had already performed at 31 venues in all countries of Great Britain. A punishing schedule by any standards, but for one as physically demanding on the body as ballet, it is almost suicidal. They must really love their Art because, unless you are a principal dancer or a soloist, you don’t enter this profession to become rich. Another consideration, is that the dancers have to get used to the dynamics of the stage they are performing at, because they would have had little, if any chance to rehearse. A you would expect, choreography follows the traditional work of Imperial Russian Ballet (later became the Kirov) Master Marius Petipa and his collaborator Lev Ivanov. Tchaikovsky’s beautiful and well known score was piped in. Unfortunately, I found the recording to be a little uninteresting – solid but not the most romantic of interpretations that I have heard. Odette was played by Elena Germanovich in this performance. A leading soloist of the Company, she performed with the elegance of beauty required of her. Her pa de deuxs with Prince Siegfried, (Alexander Misiyuk) were competently performed and balanced. Misiyuk’s solos possessed both power and exquisitely accurate timing to the music. The standout performer for me was Yoshiki Kosaka’s exceptionally springy performance as the jester. He displayed a lot of humour and charm in his performance and effortlessly became the audience’s favourite. Decent support is provided by the corps de ballet, and a very charming rendition of the “Dace of the Little Swans” by Sofia Krivushkina, Mayko Ono, Alexandra Derevianchuk and Ksenia Meleshko proved a highlight in Act 2. It’s a solid production if not a brilliant one, and has a couple of outstanding performance. The audience left happy with what they had seen if not appreciating who they were actually watching. On an overcast autumnal evening, I dragged myself down to Cardiff Bay to see Les Ballets Trockadero de Monte Carlo. Les Ballets Trockadero de Monte Carlo – doesn’t that roll of the toungue and sound as appetising as a Parisian baguette..Ballet and France are synonymous. Vaslav Nijinsky and his lover Sergei Diaghilev after creating their name in their Russian Motherland relocated to Paris where they were fixtures in salons of the avant garde and created their questionably best balletic work. In more recent times another Russian immigrant Rudolf Nureyev found inspiration in a Parisian environment and the elegance of French prima ballerina Sylvie Guillem have helped to elevate French ballet to the pinnacle of ballet aestheticism. And of course, we have Les Ballet Trockadero de Monte Carlo., to take it that step further. Wrong! Wrong! Wrong! Start again. Les Ballet Trockadero de Monte Carlo, have nothing to do with France, other than it French title. Some may argue, they have nothing to do with ballet. The troupe was founded in New York City in 1974, but origins go back a couple of year earlier. Originally playing at off-Broadway venues they received such favourable reviews that their reputation spread and the venues they played at broke out of NYC to firstly a wider American audience and then worldwide. Ten years ago, they performed at the Royal Variety Performance in front of Prince Charles. Classical Ballet is easy to make fun of. Who hasn’t performed gormless renditions of such standards as “The Dance of the Sugar Plum Fairy” getting on your pointes and then immediately falling off them? I am pretty sure that I have alluded to my own performances of the “Dance of the Sugar Plum Elephant”. – with my own choreography I hasten to add. 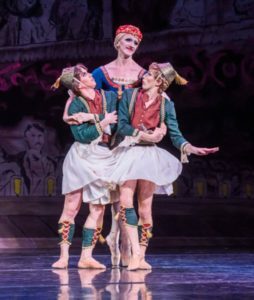 The difference here, and it is a substantial one, is that the dancers of Les Ballet Trockadero de Monte Carlo are damn good. If you cast an eye over their pedigrees, there are dancers on display that are associated in the past with ballet heavyweights such as Chicago’s Joffrey Ballet School,The Dance Theatre of Harlem,San Francisco Ballet School, English National Ballet, Beijing Dance Academy and the Central School of Ballet, (London). Although, as you might expect, the “ballerinas” are largely American, the all-male troupe also has representation from China, Japan, Cuba, Colombia, Spain and Italy. The Cardiff programme, which seems typical of the majority of other venues it is playing at on their British tour is in five segments. After a humerous off stage introduction announcing cast changes to the advertised programme, the curtain drops on dancers in their virgin white dresses assuming a pose of unexpectedly artistic beauty. The segment is taken from Les Sylphidess with music by Chopin. Eugenia Repelskii solos in The Valse, followed by Nina Immobilashvili in Chopin’s sublime Prelude, Opus 28,No. 7. You’ll know it when you hear it. Nicholas Khachafallenjar and Alla Snizova amaze you with respectively, their power and grace, before the return of Nina Immobilashvili dazzles you with another Valse before the curtain falls and the first interval. There’s not so much shenanigans on show for the next two parts, Harlequinade Pas de Deux and Trovatiara Pas de Cinq allowing such illuminaries as Sergey Legupski, Helen Highwaters, Guzella Verbitskaya and Guzella Verbitskaya showing their considerable talents to maximum effect and Eugenia Repelskii making a welcome return. For me the highlight is Olga Supphozova’s rendition of “The Dying Swan”. The segment begins with a searchlight trying to locate the stricken bird in a scene reminiscent of the clowns in Cirque du Soleil’s Varekai. When she is eventually tracked down the audience is treated to a performance of such artistic beauty, where Ms Supphozova acts out the death throes and involuntary spasms of an intensity that Anna Pavlova could only have dreamed about, all accompanied with extreme exaggerated moulting feathers – it is something to behold. Diaghilev would have blown a gasket! After the second interval, the performance concludes with the famous collaborative team of Ludwig Minkus’ s music and Marius Petipa’s Paquita which was relatively faithfully performed. I’m grateful that The Kingdom of the Shades from La Bayadere also conceived by this pair has been left alone. Throughout the performances, the audience is kept on their toes picking out the buffoonery on show. The petty vendettas, the mistimed errors, the sideways glances, the knowingly awful choreographic interpretation, the narcissistic performers, there is so much going on you can’t expect to notice it all. By the time the troupe engage in their crowd pleasing ensemble dance to the appropriate music of, “New York, New York”whilst wearing the most kitsch of hair gear a la mode of the Statue of Liberty, many of the audience were on their feet. The costumes would adorn the most prestigious ballet companies and if that’s not enough for you, then you also have the exquisite piped music. By deftly pastiching the most classical of sensory art forms, Les Ballets have created their own. Cash in your chips, (Monte Carlo – yeah?) 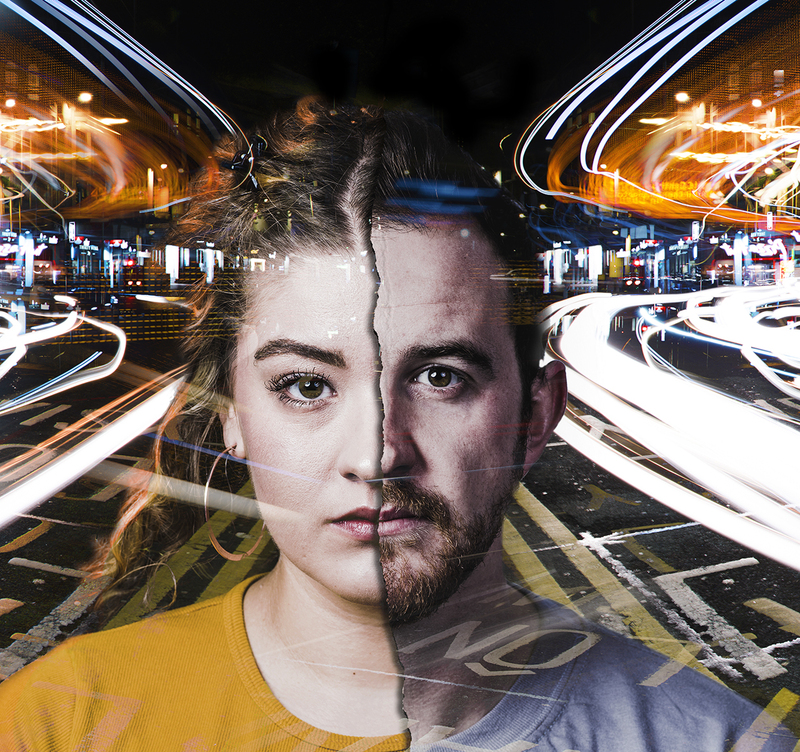 and get down to Cardiff Bay for the second and final performance in Cardiff on Wednesday evening, but check availability as the auditorium was near capacity this evening. Last March I was lucky enough to have a relative key me into ballet. 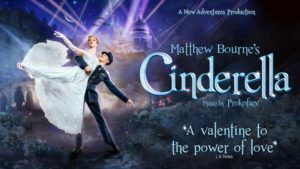 I saw Matthew Bourne’s “The Red Shoes”, and when I was invited to see his take on Cinderella, I already knew I was bound to have a wonderful time – and I did. Though The Red Shoes will always harbour a soft spot in my heart because it was my first ballet, I think it’s safe to say I liked this one much more. First of all, as a novice, I think it’s pretty important that this time, I knew what was going on. The story of Cinderella does not escape me even as it harbours a few changes (like being set in London 1940 and having a war theme, and Cinderella’s family being bigger than I remembered). Costumes were incredible, and I think by “costumes” I mean “Cinderella’s dress”, because if we’re being honest, I was excited to see what it would look like as an audience member, rather than in pictures and pamphlet photos. And it was stunning; truly. Even her costume before the dance was lovely. I’m always a fan of flowing skirts and dresses, so seeing the way they moved as people danced was such a treat to my eyes. So, in that vein, the dancing was incredible. Still, a year later I don’t know much (or anything) about ballet or dancing in general and my eyes continue to be unaware of mistakes and unable to form any critiques (not that I have any at all, actually). When I left The Red Shoes, I remember I came out on a high, as if I could suddenly redirect my life even though it was 10pm and I would be going home to bed afterwards. The same high followed me out of the theatre after Cinderella. An odd kind of high, one that left me sitting quietly and thinking and reflecting and just trying to figure out what words I would use to really show how much I loved this performance. I couldn’t find many. It’s definitely a “you have to see it to understand” kind of thing (which is why I’m going a step further to place some links here: in case anyone becomes interested in going). Five stars because it really was wonderful and I’d love to see it again and I know I would enjoy it just as thoroughly every single time. The interview excerpts of Sir Matthew Bourne are copyright New Adventures Production. If I have inadvertently used any other copyrighted material, please let me know – I shall be happy to acknowledge the owner or remove. 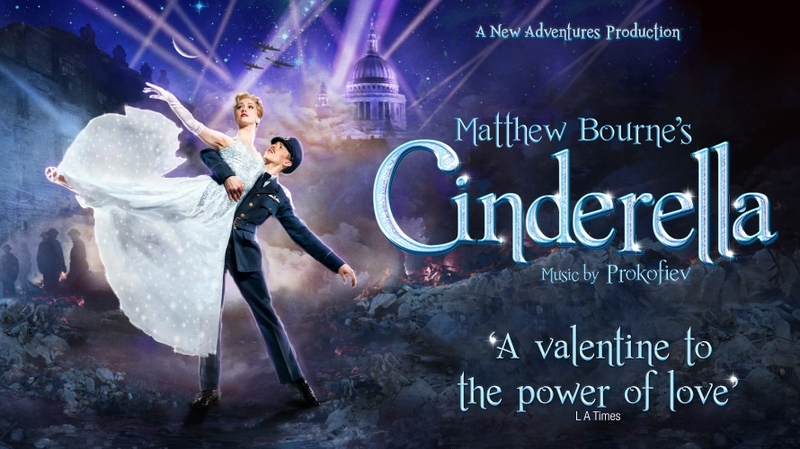 Matthew Bourne’s ballet, “Cinderella” is currently playing at the WMC until 7th April. It provides a scintillating experience of creative development of a familiar story. Set in the London Blitz of WW2, this is not a gimmick, but a version that works on every level. Cinderella is pretty much as you would expect, wicked step-sisters in tow, but there is no Fairy Godmother. Instead you have a male character called The Angel who guides Cinderella for good and bad in order that she fulfills her destiny. Instead of a handsome prince, you have Harry the Pilot. The RAF, recent victors in spoiling the Luftwaffe’s attempt to pave the way for the Nazi invasion of Britain, were the glamour boys of the Armed Forces. Actually. they were known as The Brylcreem Boys due to the way they used the cream to obtain a smooth look with hair in total control. The Ball scene, is re-invented in the real life venue of the Cafe de Paris, which was a venue where chic young people met and danced the night away, irrespective of whether there was a air-raid being enacted overhead. On the 8th March 1941, the club received a direct hit, killing and wounding over a hundred people. 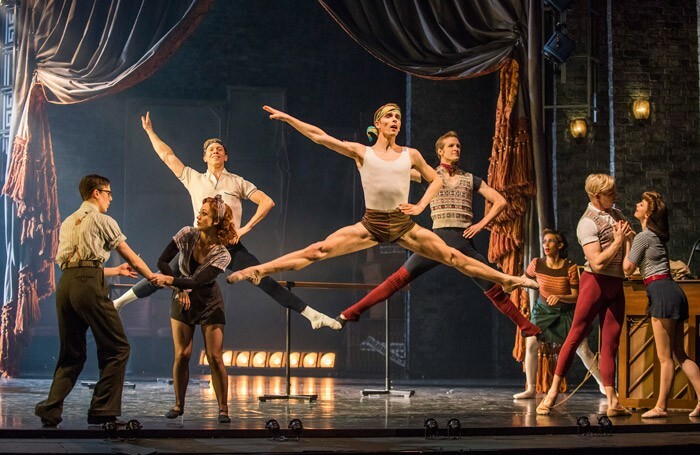 The dancing is as polished as you would expect from a Matthew Bourne work. He is the director and choreographer and together with his lighting designer Neil Austin and set and costume designer Lez Brotherston, conjour up a magical two and a half hour show of countless memorable visual delights. Music is recorded, but played by a specially commissioned orchestra, over 80-strong, named the Cinderella Orchestra, and it is played in Sensurround which makes you feel that they are present. Prokofiev’s music is delightful and all the sums add up to a wonderful work of creativity. Irrespective of whether you like ballet or classical music, there is enough theatricality in this show to last you a very long time, and I unreservedly recommend it. 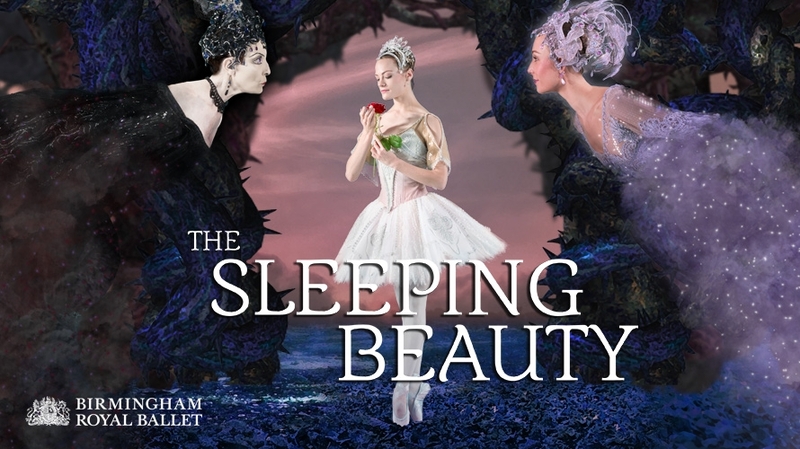 The Sleeping Beauty is probably the best classical ballet in the world. It has more famous tunes than any other, so with great anticipation I attended at the WMC to witness the Birmingham Royal Ballet’s lavish production of Tchaikovsky’s masterpiece. The BRB has a long connection with this work. As long ago as 1949. the eminent ballet critic Richard Buckle was commenting on this, although he referred to a production by the Sadler’s Well Ballet , the company that evolved into the BRB in 1990. Today, together with the Royal Ballet and the English National Ballet, the BRB completes the “Big Three” ballet companies in the U.K, so you know that a quality production will be on show. We all know the story. In the palace, the King and Queen await the christening of their only child Princess Aurora. All the fairies are invited to the ceremony and are to be godmothers to the princess. However, Carabosse, the ancient Fairy of wisdom, seems to have been on extended leave and hadn’t been seen for years, so she is not invited. The fairies, led by the Lilac Fairy, arrive and present their gifts, but then, spurned Carabosse and her gang of evil fairies turn up and lay a curse on the princess, saying that on her sixteenth birthday, she will prick her finger on a spindle and die. All is not lost because the Lilac Fairy, although being unable to remove the curse, issues a counter spell whereby Aurora will not die, but fall into a deep sleep, even longer than the semi-comatose state that I find myself in after consuming a bottle of Malbec! In fact, the only thing that will awaken her up is that a prince who truly loves her will plant a kiss on her. Right on cue, at Aurora’s sixteenth birthday do, Caraboose, in disguise, tricks her way into the celebrations and presents the poisoned spindle to Aurora, who captivated by something she hasn’t seen before, dances with it, but is then pricked with the potentially fatal poison and collapses. Step in the Lilac Fairy who reminds all present that the princess is not dead but sleeping, and deciding that everyone should have a good kip, places a spell of somnolence resulting in all present falling asleep. The story now moves on a hundred years when Prince Desire out hunting with his cronies is waylaid by the Lilac Fairy, who happens to be his godmother also, and she takes on the part of Cupid introducing the Prince to Aurora’s spirit. Well the inevitable happens, and after a brush between Caraboose and the Lilac Fairy, the Prince falls in love with the princess and the final act consists of their wedding ceremony. The tale is adapted from Charles Perrault’s 1697 work, which, in turn was based upon an earlier story. It is essentially a tale of good and evil represented by the characters of Caraboose and the Lilac Fairy. 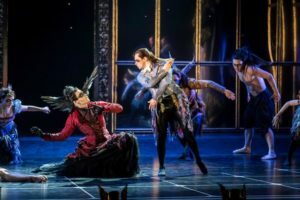 In the ballet, each of them have their own leitmotif, and in case of any doubt of the audience, in this production Caraboose is dressed in black and the Lilac Fairy in white. 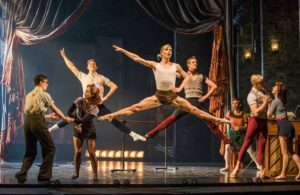 This production, created by Sir Peter Wright in 1984 for the Sadler’s Wells Company largely follows the original 1890 version, choreographed by the master of classical ballet, Marius Petipa. In fact, such is the skill of this nineteenth century choreographer, many of the leading ballet companies of the world still base The Sleeping Beauty in their repertoire on Petipa’s version. To stage The Sleeping Beauty is a logistical nightmare. By some way, the largest production that the BRB has in its repertoire, the demands on the costume department are immense. Princess Aurora wears three different tutus, and as there are nine ballerinas performing this part over the course of the tour, that requires twenty seven costumes to begin with. In fact, it takes an articulated lorry to transport the costumes alone between venues. The dresses the Court Ladies wear weigh over six kilos and Caraboose’s gown double that. Some of the costumes are so wide, navigating through doors is a skill in itself. Due to the high expense making these costumes, they are continually being repaired, and many of those on view today originate from the 1984 production. What struck me most about this production is how opulent it is. The beautiful costumes, the grandiose sets and the marvellous lighting. In particular, the second Act set in the forest where Prince Desire is hunting, has a mystical quality that transports you into this world of fantasy. 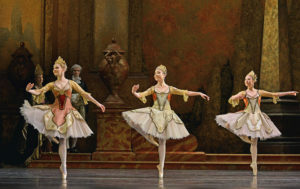 The role of Princess Aurora is said to be the most difficult in classical ballet consisting of steel point work, sharply accented spinning turns. First Artist Karla Doorbar acquitted herself well, managing to portray the beauty and grace of the princess. The nomenclature of the Prince is a little confusing. In the programme playlist, he is called Prince Florimund, although in the 1890 production, he is called Desire. It is speculated that the name change came about in the 1970’s originating from the Royal Ballet’s production at that time. In the role of Florimund/Desire, First Artist Max Maslen manages the soaring leaps and daring lifts with aplomb and complements Doorbar’s Aurora as exemplified in their majestic Pas de Deux in the final act. First Artist Jade Heusen portrayed the evil Carabosse with suitable menace, whilst conversely, Principal Dancer Jenna Roberts looked the personification of all good things in the role of the Lilac Fairy. The Prologue pas de six with the fairies was cutely performed and the various cameo appearances in the final act were well presented. I particularly liked the Kit Holder and Anna Monleon’s Puss-in-Boots and the White Cat. However, it is the Panorama scene towards the end of the second act, that always moves me the most in versions of The Sleeping Beauty I have seen over the years. Tchaikovsky’s languid melody matched by Petipa’s beautiful choreography and heightened by the mystical set design by Philip Prowse and the lighting of Mark Jonathan, conjure up a feeling of emotion within me, reminiscent of a truncated version of the Paris Ballet’s “The Kingdom of the Shades” from “La Bayadere”. Finally, a special mention should be made of the wonderful rendition of Tchaikovsky’s score by the Royal Ballet Sinfonia under the baton of Paul Murphy, who provided a faultless performance. Their interpretation of the famous Waltz in the second act, didn’t fall into the trap of playing it too slowly that I have sometimes encountered in recorded versions. 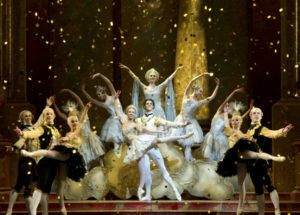 All in all The BRB’s The Sleeping Beauty is an excellent production and well worth the modest ticket price. That is, modest for a production involving so many people, and I can thoroughly recommend it. 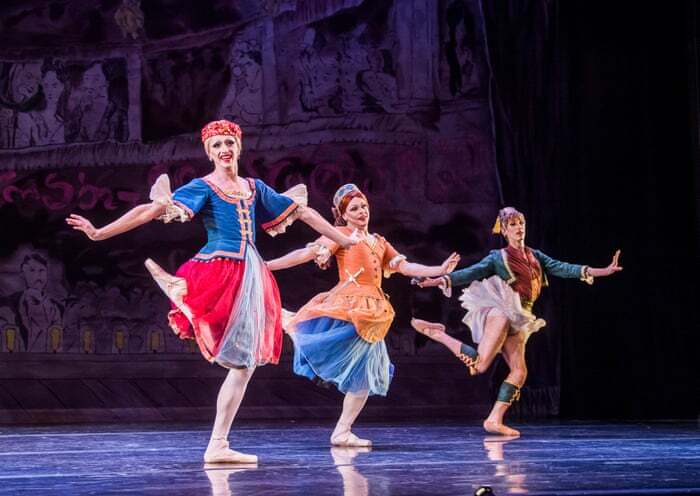 It provides the perfect introduction to the world of classical ballet and it is heartening that I witnessed a number of young children at the matinee performance that I attended. The Sleeping Beauty is a ballet with a Prologue and three acts lasting approximately two and three quarter hours including two intervals. It is suitable to all over the age of five. At Cardiff’s WMC it has two performances on the 17th March at 1430 and 1930. before moving on to the Theatre Royal in Plymouth. I don’t know very much about ballet. In fact, this was my first time ever seeing one. I was completely swept away by the beauty and the elegance of it. I did manage to follow the story. Although at first I was definitely a little lost. I did pick up the conflict between choosing passion or choosing love, and the eventual consequences that come to light as a result of the character’s decisions. The dancing was gorgeous. Every single person on stage managed to look beyond elegant, and way beyond beautiful. The music alongside was amazing to see. Everything was so in sync and perfectly aligned, like the cat wasn’t well-practiced, but more like dancing to it was intrinsically within them and not something they had to even think twice about. Like I said, I don’t know very much about ballet. My eyes aren’t critical to the specifics of the dances, but I was unaware of mistakes and critiques in a borderline blissful way. I enjoyed something pretty and stunning. And I really, really liked it. The setting was cunning, and extremely clever. There were things I didn’t expect to be used at all – like shadows, or smoke, the front of a train, audio of clapping – which I did mistake for the audience – and so forth. The ideas behind the production seemed big and well-thought out. Something daring but equally safe. The English Youth Ballet recently put on an amazing show at the New Theatre in Cardiff, we were invited along to watch this show and as a parent of a dancer I was keen to go along. We hadn’t been to the New Theatre before so as we wandered across to where it stood I was quite interested to see the exterior, the New Theatre in Cardiff seems to be a tiny little theatre from the outside, and compared to some I suppose it is quite small, however when we walked into the theatre itself I felt as though I was transported back in time. The curtains and the ceiling and all of the decor just reminded me of the theatres you would see in the old movies. Which I think it adds to the atmosphere, even the cushions for the children to sit on were made out of red velvet. The staff were incredibly friendly and hospitable as well. So we waited for the show to start with our snacks and drinks, and as the children came onto the stage I realised that the show and the theatre itself really were a perfect fit. I have seen a couple of ballet shows that were very modern and the outfits very up-to-date, however this one really did stick to the original story and all of the beautiful dresses, outfits and tutus just added to the overall effect. As a parent of a ballerina I know how much effort goes into the rehearsals and how much effort goes into each and every one of the moves, which is why I could really appreciate the effort and how well all of the dancers did in this production, every move they seemed to carry out effortlessly, even though I know it must have been very much hard work for them. Also the story was told through the traditional ballet hand movements which was wonderful to see and carried out flawlessly in my opinion. As the show moved on I really spotted some of the amazing talent on the stage, some stood out and the villain of the show really captured my attention as did the smallest children, as it takes a lot to stand on a stage in front of all those people but they seemed to enjoy every second. I’m no expert however the show entertained myself and two children and we thoroughly enjoyed ourselves. The standing ovation at the end really highlighted the fact that everybody there really did enjoy The Sleeping Beauty production. One point I would make as well is that there were a few noticeable wobbles at one point and the dancers kept their composure and carried on regardless, I admire that above all, as that sort of poise and commitment proves a real talent. Thank you to everyone that stood on that stage and danced their socks off! We really enjoyed the evening. 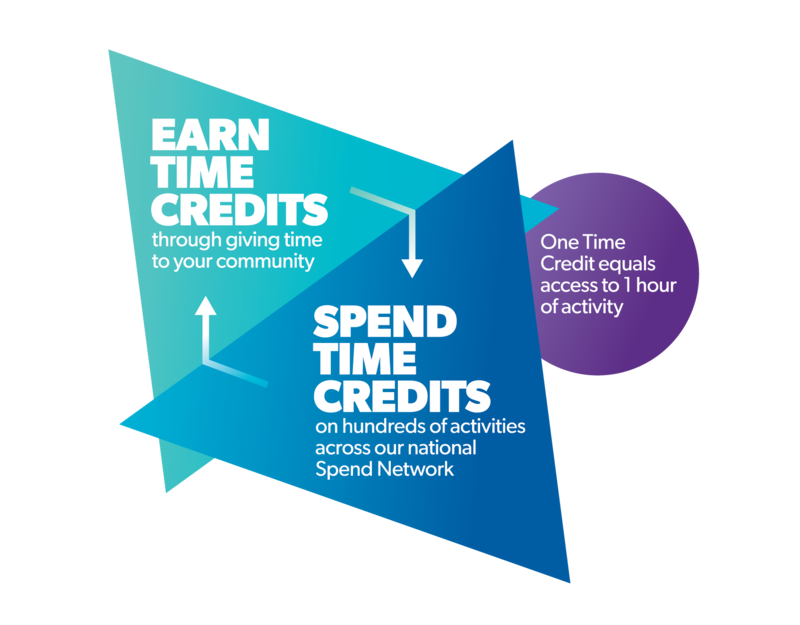 Patricia is part of the Time Credit network supported by Spice. She accessed her tickets through volunteering in her local community. 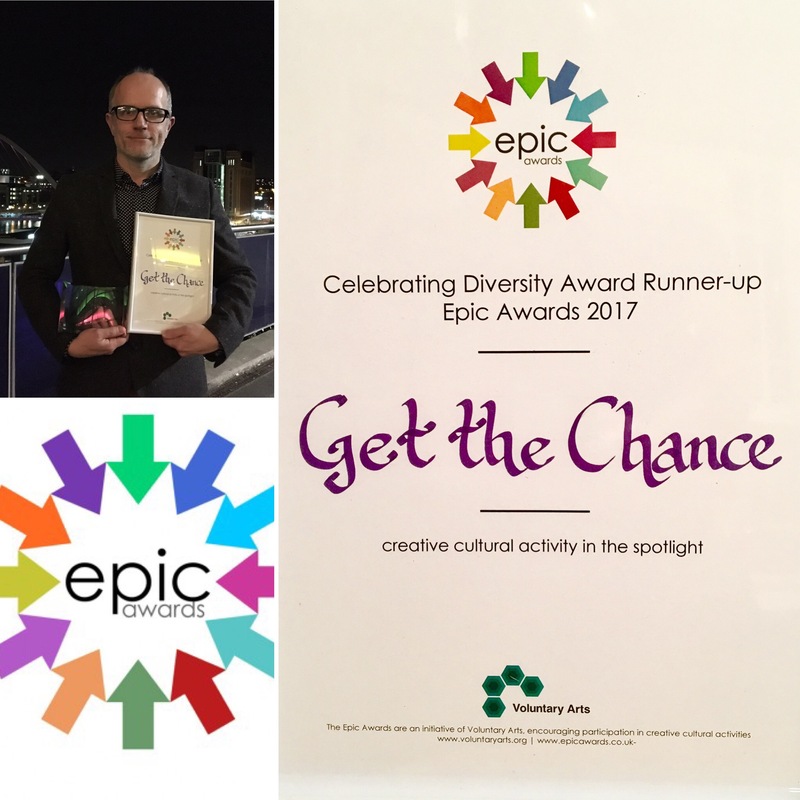 Many volunteers and Spice Time Credit users recently had an unexpected and very welcome trip to the ballet Sleeping Beauty. 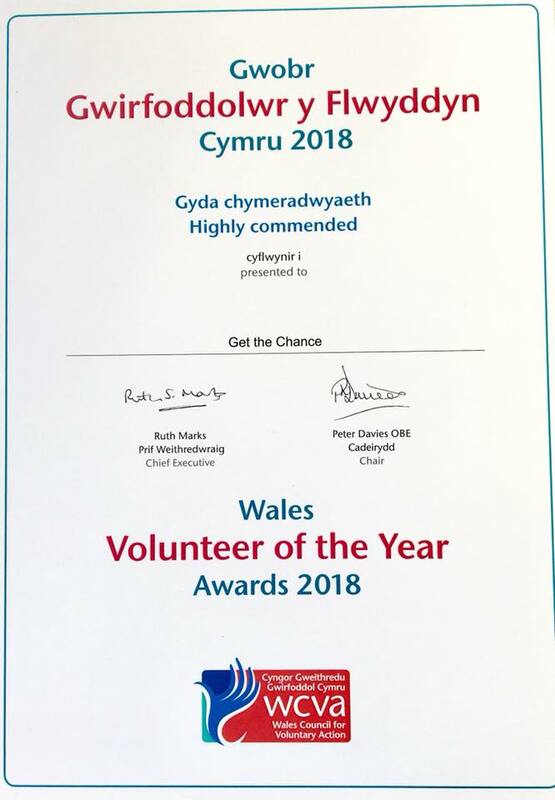 Wales Millennium Centre had generously offered tickets to be used by members of the community who could ‘pay’ with their well earned Time Credits. The tickets were quickly taken up and many had to admit that they had never seen a ballet and some had never visited the WMC before so what an opportunity this was to get close up and personal to a fabulous performance. But this was no ordinary Sleeping Beauty. 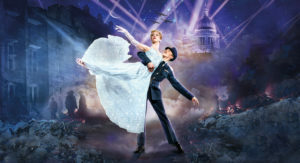 The Matthew Bourne production was full of colour, movement and energy performed to the well known music by Tchaikovsky. It was a gothic tale for all ages, a love story fraught with curses and spells. The costumes were outstanding, from the very first scene setting the christening of Aurora with a life-like puppet of the baby girl drawing in the audience from the beginning. We watched as the familiar fairy tale of a young girl cursed to sleep for one hundred years was enacted and danced through various scenes. As Aurora grows up, we were taken through the fashions of the day, including a genteel tennis game followed by afternoon tea on the lawn, watching the antics of her suitors as they tried to gain her attention. Years later, when Aurora wakes up, we are in the modern world, still beset with many temptations and sinister goings-on. It was an outstanding performance, full of magic, fairies, vampires, love and romance, danced by incredible dancers . There was certainly no falling asleep during this performance. Thank you once again to the Wales Millennium Centre for giving us the opportunity to experience a beautiful and amazing ballet.